Last season, Nebraska ranked 119th in the nation with 14 sacks. The Huskers also ranked 129th in tackles for loss with 44. With numbers that poor, Nebraska’s defensive staff have been looking answers to fix the pass rush. In defensive coordinator Erik Chinander’s multiple 3-4 defense, there can be a lot of exotic pressure dialed up from the linebacking corps. In an attacking 3-4 defense you often think of outside linebackers applying that quarterback pressure. The Huskers have options at the position. They have the veteran of the group Luke Gifford back of an injury last season. There is also transfer Breon Dixon. Plus, there's Tyrin Ferguson, a player getting rave reviews since the new staff arrived. Those three players will factor into the outside linebacker discussion this season. Yet, what about the young players at the position? Guy Thomas would fit the description of an explosive athlete. The Booker T. Washington High School standout represented a big win on the recruiting trail a couple of seasons ago when Nebraska plucked him out of Miami. Thomas’ speed off the edge made him an intriguing option to move outside when Nebraska made the move to the 3-4 defense last season. Thomas has bulked up some and has added 30 pounds to his frame according to the media guide. Outside linebackers coach Jovan Dewitt was familiar with Thomas from his days recruiting South Florida and knows Thomas’ high school coach well. Dewitt had praise for Thomas’ future when he spoke to media this week. “Guy Thomas is going to be a really good player,” Dewitt said. Another player Dewitt can’t wait to see develop is true freshman outside linebacker Caleb Tannor. The Georgia pass-rusher came to Lincoln with the look of a player ready to contribute right away. 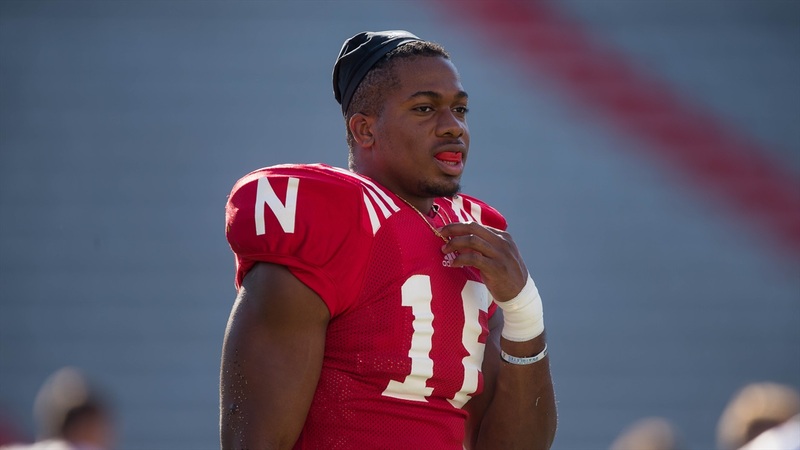 There was a plan put in place for the defender to hit the ground running in Lincoln. You can credit Tannor for working hard between National Signing Day in February and arriving on campus this summer to be in shape and learn the defense as much as possible. Older players modeling the way and taking players under their wing is something that head coach Scott Frost wants to see in his program. That’s a great sign because the Huskers will need all hands on deck to improve the numbers from last season and be more disruptive on defense.